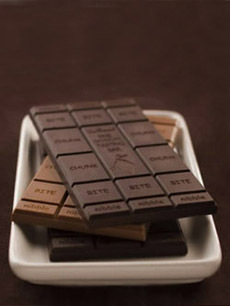 Gourmet chocolate bars. Photo courtesy DeBrand.com. CAPSULE REPORT: Master the terms in this “chocolate dictionary,” and you’ll be able to hold your own with any chocolate professional. Our glossary of chocolate terms and definitions is more like a Chocolate 101 course. This glossary contains mostly original source material written by Editorial Director Karen Hochman and Chocolate Reporter Peter Rot, plus edited compilations and revisions of materials from THE NIBBLE files. Its goal is to provide the most comprehensive resource for consumers who want to become better educated on the topic of chocolate. As with any dictionary, five different sources will yield five slightly different definitions. This is the first page of an extensive glossary. On any page, if you think we should consider chocolate terms and definitions other than those we have provided, click on the Contact Us link on this page. Also enjoy our many other food glossaries. The French term for rolling out gianduja or marzipan with a rolling pin. In English, the French Academy For Confectionary and Chocolate. An independent, non-profit body representing the chocolatiers and confectioners of France. Its aim is to promote quality products, to train and inform professionals and consumers and to provide information on chocolate products. The flavors lingering on the palate after the chocolate has been consumed. Called the finish in the wine industry, this term is increasingly applied to chocolate. A good aftertaste should leave positive chocolate flavors in the mouth for two minutes or more. A process of neutralizing the acidity of cocoa with potassium carbonate. This also brings out more chocolate color, resulting in a darker cocoa. Also known as Dutch process or Dutching. Since the end of the 19th century, all commercial chocolate manufacturers have used this technique, which modifies the flavor and color of the cocoa. Cocoas and chocolates that are 100% natural will not be alkalized. One of the finer subgroups of Forastero bean, delicate and mild-flavored (most forasteros are harsh and bitter). It is a hybrid of the Arriba or Nacional subspecies of Forastero bean. Dark chocolate has been found to have a high level of antioxidants, specifically from its flavanol content. See flavanol. Artisan chocolate, like any artisan product—jewelry, furniture, couture clothing—is handmade by a skilled artisan in small batches, using time-honored and honed skills. Modern artisans are also innovators in flavor and technique. No assembly line is used to make artisan products and they are never made in large quantity; you will find chocolatiers in the kitchen preparing and packing each batch. A batch of 10,000 boxes or bars is not an artisan product. However, more than a few midsize companies use the term “artisan” to describe chocolate that is not handmade, and even industry associations don’t get terms right, which confuses consumers. See also boutique chocolatier.